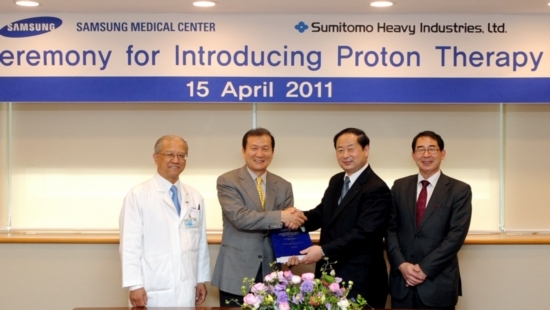 Tokyo, April 24, 2011 AEST (ABN Newswire) - On 15th April, 2011, Sumitomo Heavy Industries Ltd ( TYO:6302) (President Yoshinobu NAKAMURA, "Sumitomo Heavy Industries" hereafter) signed the implementation contract for the Proton Therapy System with Samsung Medical Centre (Seoul, Korea), the key hospital of the Samsung Group in Korea. Established in 1994, the Samsung Medical Centre (1951 sickbeds) is equipped with the latest medical infrastructure and has been globally promoting diagnosis, research and education. By providing the best diagnosis and patient-focused services, it has been voted as the leading hospital by client satisfaction research in Korea. The received order for the Proton Therapy System is equipped with two sets of Rotational Gantry Systems that have attained significant achievements at the National Cancer Centre Hospital East Japan, and enables selection of either the Pencil Beam Scanning Irradiation, the latest irradiation technology using the characteristics of the proton beam, or the existing irradiation (the Wobbler type) depending on the shape of the target cancer. In addition, the system adopts a highly precise patient positioning system with a combination of a 6-axis, Robot Operated Treatment Bed and X-ray imaging, as well as the availability of Intensity Modulated Proton Therapy (IMPT). This Proton Therapy System is to be installed at the newly built Proton Therapy Centre and will be completed by November, 2014. Proton therapy is a kind of radiotherapy which intensively irradiates the proton, the atomic nucleus of hydrogen, which has been accelerated to a state of high energy. As it concentrates on the lesion, minimising unnecessary irradiation towards adjacent normal tissues, we expect less side effects during the treatment. It has attracted global attention as a 'friendly' and outpatient type cancer treatment in comparison to conventional surgical cancer removals. Sumitomo Heavy Industries has been researching and developing proton cancer therapy for over 30 years. In 1997, Sumitomo delivered the hospital installation type proton therapy system, the first in Japan and the second in the world, to the National Cancer Institute (presently the National Cancer Centre Hospital East, Japan). Since then, this is the 6th order (4th from overseas) following sales promotion both at home and abroad. Sumitomo Heavy Industries is contributing to promoting use of the proton cancer therapy in cooperation with client hospitals through the use of cutting edge technology evident in the Proton Beam Therapy System.